IATCB’s testing corporation has a new web page. This will make it easier for you to navigate and gather information on our exams. PTC Launched a New Website! IATCB would like to encourage you to become certified. The registration for both the Bird and Animal trainer’s certification is open now! Don’t forget to register and start studying! When working with ambassador animals, you have to be flexible. Animals do not fit into molds, so our expectations can’t be rigid, either. It’s also important to recognize that not every facility has limitless resources, and we can’t all just pull our animals out of programming the second a behavioral issue pops up. In addition, not every institution has the opportunity to choose ambassador animals and receive them during their critical period to set them up to succeed. 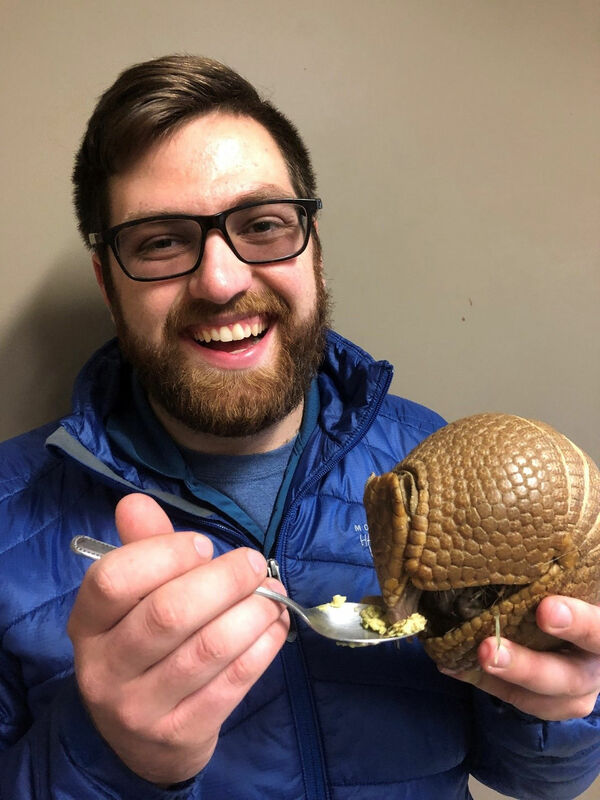 The Nashville Zoo has a three-banded armadillo that historically was presented by picking him up and holding him, or by putting him within small fencing and letting him run around. For a while, this was not high-stress for the individual, but it became less and less positive over time. This culminated in the armadillo beginning to aggressively pull at the lower part of his carapace with his front claws, resulting in superficial injuries. It was clear that our armadillo needed to have more choice and control. To aid in this process, he was given a good amount of time off from programming. During this time, his enrichment and husbandry schedules remained the same, and his welfare was still frequently evaluated, but he was not handled except for cursory examinations on a monthly basis. At this point, we did not have the resources to properly train him to participate in programming. He had to be put on the back-burner so that in time, he could be successful. Recently, I have begun more intensive training for this armadillo. I first identified some potential reinforcement—he did not respond positively to tactile reinforcement or novel objects, and he only showed mild interest in scents, but he did respond favorably to avocado. I’m now able to touch and lift him up while feeding him mashed up avocado from a spoon. At this point, I am just working on very slow desensitization, which is nothing groundbreaking, but it is very rewarding to see a universally adored ambassador animal participate willingly in his work. I share this as a reminder that giving up on our animals is not an option: It certainly might be easier to send this armadillo away and get a more tractable juvenile in, but we made a commitment to this individual, and we want to see that through. As a department, our Behavioral Husbandry team is trying to be as flexible as possible to ensure the success of our staff and ambassador animals. Turtle doves have featured in art and culture for thousands of years. Their beauty, song and behaviour inspired Ancient Greeks and Romans, Elizabethan poets, modern musicians, and painters. Perhaps because of their endearing, soothing purr and tender affections when seen perched in pairs, they have long been symbols of love. Turtle doves are the UK’s fastest declining bird species and they are threatened with global extinction (IUCN Red List of Endangered Species). The full name for the species of turtle dove we get in the UK is the European turtle dove (Streptopelia turtur). There are 5 other species of turtle dove living around the world, out of a total of some 350 species in the dove and pigeon family alive today; 17 species of this family have already faced extinction because of humans, notably including the dodo and passenger pigeon. There are four main factors associated with the decline of turtle doves. These include the loss of suitable habitat in both the breeding and non-breeding range, unsustainable levels of hunting on migration and disease. Turtle doves are a vibrant, dainty species of dove (weighing in at around 140 grams) with a charismatic turrrturrr-ing call from which its name derives. In the UK it feeds in open habitats most commonly on arable and mixed farmland, where its staple food of wildflower seeds and farmed crop grains are found on the ground. Near to its feeding grounds, the species nests and roosts in open woodland edges, hedgerows and scrub areas. Turtle doves are the only long distance migratory dove species in Europe, with their more common relatives such as the collared dove and wood pigeon staying in the UK year-round. They complete annual migrations from their breeding grounds, leaving in mid-late summer, through western Europe to their wintering grounds in West Africa; they typically return to their breeding grounds during April. 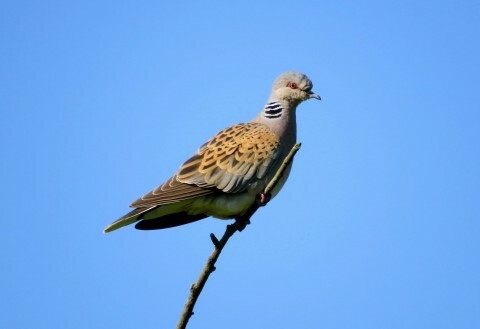 The UK has around 14,000 breeding pairs of turtle dove according to their last national population estimation in 2009. The best chance you have to see the species is in East Anglia and South-east England, where the species has maintained its highest densities.